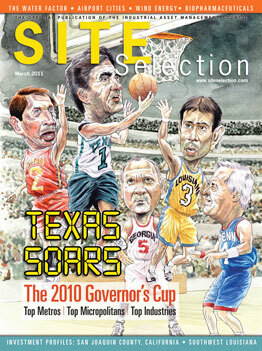 Site Selection’s Governor’s Cup returns to Texas, where Governor Rick Perry has some thoughts on how to make all states more competitive. For a synopsis, see the Tenth Amendment. An in-your-face approach propels a social commerce company to new heights, signaling a new era for Second City. Davidson County, N.C., surpasses all micropolitan areas in the U.S. in corporate real estate projects in 2010. GE Power & Water’s chief sustainability officer compiles a world’s worth of lessons in water use and conservation. As the cost of corporate and regional headquarters operations comes under heightened scrutiny, new locations emerge as contenders for the home office. Simultaneous undercapacity and overcapacity pose challenges for biopharma firms. As Steelcase prepares to move out of its Corporate Development Center, a landmark Grand Rapids building beckons new users. Lists of largest projects in the U.S. and around the world ranked by investment, job creation and square footage. Automotive companies invest from east to west across an enormous region full of emerging markets. New aerospace and logistics developments at Amsterdam Schiphol are adding to this airport city’s location credentials. Commercial investment in the wind energy market is strong so far in 2011, following a lackluster 2010. Is this renewable-energy sector now ready for its close-up? Connection is critical for any business. In Greater Fort Lauderdale, multinational firms find a safe haven and desirable tax climate for corporate operations. Nearshoring is growing in Central America, but some countries may be reaching saturation. Izmir wins out over all of Eastern Europe for Cummins’ first manufacturing plant in Turkey. In Scotland, an alternative-energy future beckons, and the present day suffices. A property management firm hires a specialist to sort out its IT infrastructure. Tool maker, railroad player and the nation’s freight handler, Chicago still lures them, high taxes or no. Gov. Mitch Daniels may be Indiana’s leading asset. The next chapter in Florida innovation could be a tale told by a mouse … but not the mouse you think. High-tech, cleantech, bio and logistics provide economic momentum for a beleaguered state. Life sciences companies thrive in Maryland. ‘Project 21’ is the latest of many projects to land in Memphis. These project snapshots paint a picture of a region looking to the future. A new governor builds on the success of big projects to lure more firms to Wyoming. One food processor moves into an historic industrial site, another goes solar and a third will build a new plant to serve a growing market. New Mexico’s new governor knows businesses have plenty of location options. How entrepreneurs are turning one of Minnesota’s abundant natural resources — solar energy — into a promising new industry sector.